Looking for a low carb appetizer to take to a football party this weekend? 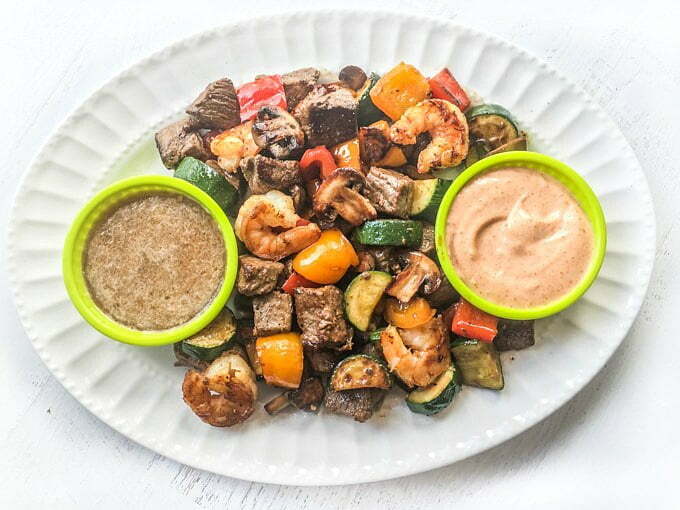 Try this low carb hibachi steak appetizer with shrimp and vegetables. There are also two delicious dipping sauces that go with it! This post is sponsored by the Certified Angus Beef ® brand in conjunction with a social media campaign through Sunday Supper LLC. All opinions are my own. Check out this low carb buffalo chicken stuffed mushrooms appetizer. Lately I’ve been craving hibachi steak and shrimp. We were even on our way to the restaurant when my son vetoed therefore we went elsewhere. 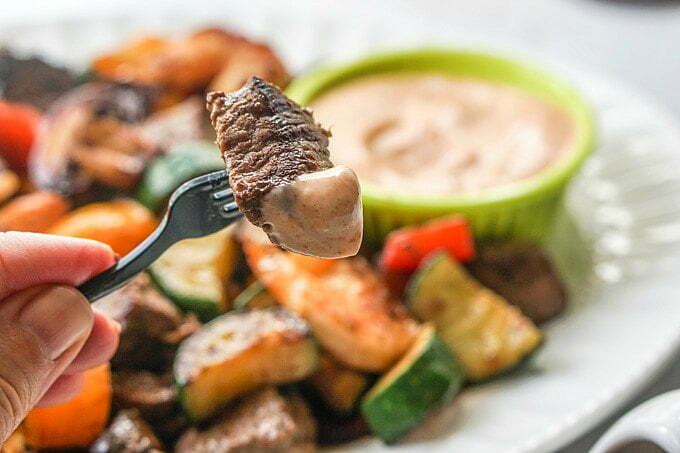 However with the big game coming up on Sunday I decide to make this low carb hibachi steak appetizer with the classic ginger and yum yum sauces. 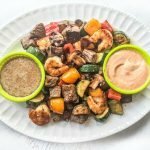 I also added some vegetables and shrimp because they were low carb and make for a big appetizer platter. It was YUMMY and satisfied my craving! 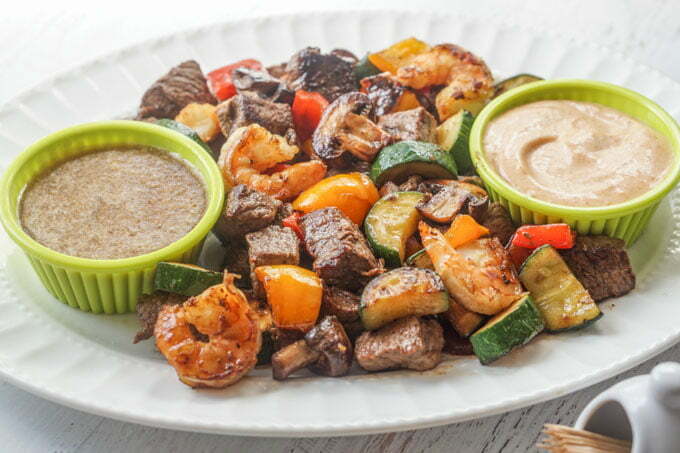 The brown ginger dipping sauce and the creamy yum yum sauce go great with the steak, shrimp and the vegetables. The ginger sauce is made from fresh grated ginger, soy, onion, vinegar, lemon juice, garlic, Swerve brown sugar and sesame oil. The yum yum sauce ingredients are mayo, tomato paste, Swerve sweetener, garlic, paprika, butter and cayenne powder. 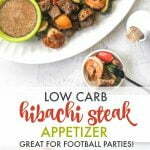 This low carb hibachi steak appetizer is great for football parties! I wasn’t sure what kind of beef to use so I ask the very helpful butcher at Giant Eagle. 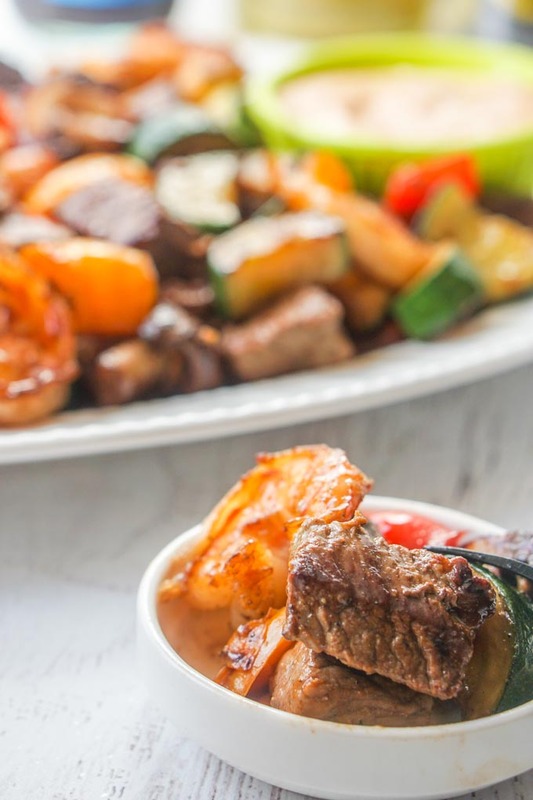 I knew I wanted Certified Angus Beef® because the steak was going to be the star of this dish and I wanted it to be tender and delicious. The butcher suggested I use sirloin steak and so that was what I used. It was delicious ! I will definitely be making this for dinner again real soon. 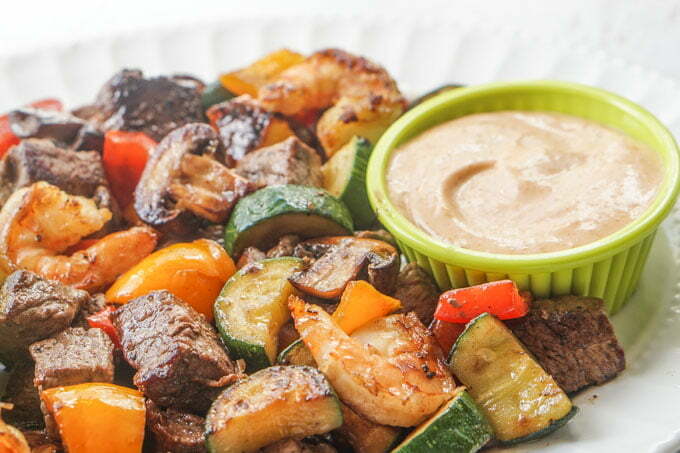 Use a good sirloin steak for this recipe because you want tender, delicious meat! I like to use a cast iron skillet to cook my steaks and burgers to get that nice brown sear. First cut the steak in equal bite sized pieces and liberally sprinkle salt and pepper. Add some butter to a hot pan and cook the meat for about 3 minutes. Don’t mix them, let them sear. Then flip them and cook another 3 minutes. That’s all I did but in case you made bigger chuck, cut one open to see if it’s cooked. When the steak is cooking microwave your vegetables for 3 minutes. After you cook the steak, take it out and let it rest. Add a bit more butter in the pan along with the vegetables and cook for 3 more minutes. Add in the shrimp and cook for 5 minutes, stirring frequently. Lastly add back the beef and sprinkle the sesame oil all over. Mix well and cook for a minute to infuse with the sesame oil. A tender piece of sirloin steak dipped in the creamy yum yum sauce. 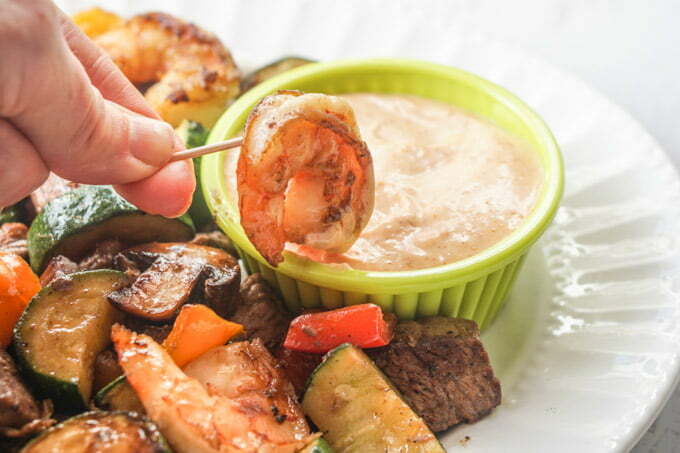 Succulent shrimp dipped in the creamy yum yum sauce. Sauteed mushroom dipped in brown ginger sauce. You can make the sauces a day ahead of time if you wish as well as cut up the meat and vegetables then too. 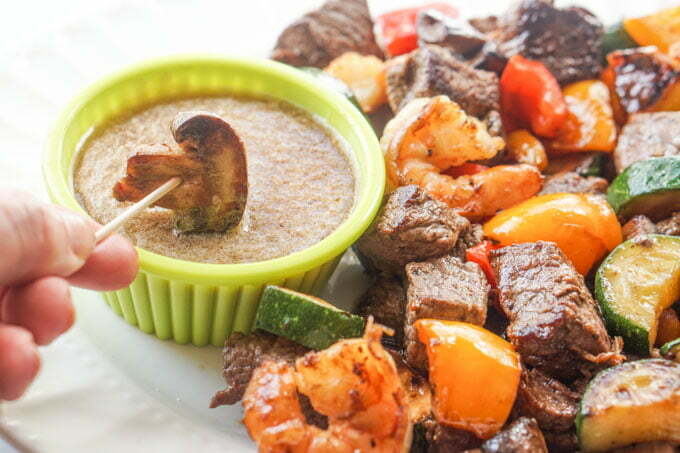 That way you only have to do a quick stir fry to make this low carb appetizer! This would also make a fun and delicious dinner! Looking for a low carb appetizer to take to a football party this weekend? 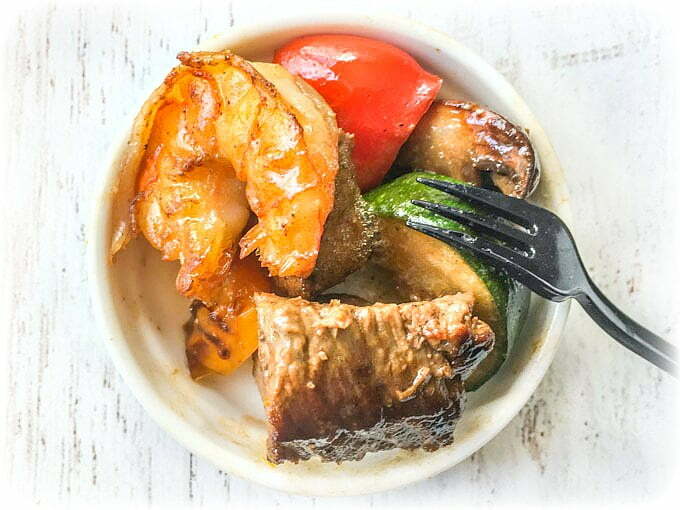 Try this low carb hibachi steak appetizer with shrimp and vegetables. There are also two delicious dipping sauces that go with it! First cut the steak in small but equal sized pieces and liberally sprinkle salt and pepper. 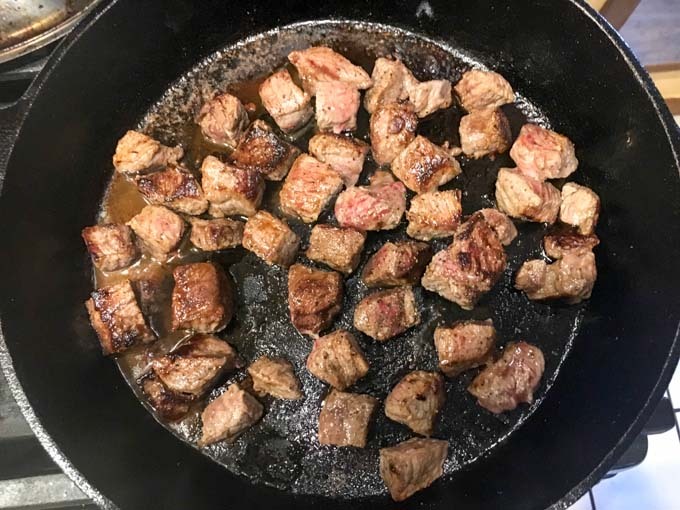 Add some butter to a hot pan and cook the meat for about 3 minutes. Don’t mix them, let them sear. Then flip and cook another 3 minutes. Cut one open to see if it’s cooked. After you cook the steak, take it out and let it rest. While the steak is cooking microwave your vegetables for 3 minutes. Add a bit more butter in the pan along with the vegetables and cook for 3 more minutes. Add in the shrimp and cook for 5 minutes, stirring frequently. Lastly add back the beef and sprinkle the sesame oil all over. Mix well and cook for a minute to infuse everything. Add the garlic to a food processor and pulse until well chopped. Add in the rest of the ingredients and process to mix well. Store in refrigerator until ready to use. Can make this ahead of time. Add the onion and garlic to a food processor and pulse until well chopped. Add everything else to the bowl and mix to combine. Can also just do this by hand with out the food processor. Store in refrigerator until ready to use. Can make this ahead of time. 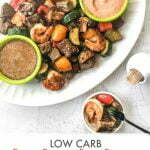 Previous Post: « Easy Roasted Veggie Noodles – a healthy vegetable pasta recipe! The steak was excellent. The sirloin was perfectly done. But the star of this show was the sauces. I’ve been to the hibachi steakhouses and the were spot on. So glad you liked it sweetheart!